Few days ago I have received a Kindle DX. For a long time i thought about buying one and finally I did it. It was clear to me that I’m getting DX because of the screen size. The regular Kindle narrow lines looks annoying. AFTER I’ve got it, I started to think why did I buy it? Will I start to read all my books on Kindle? No. First of all, I like the feeling of a real book better. Second, some of the books are unavailable on Kindle, especially books in Russian and Hebrew that I read. BTW, Kindle DX does not support Unicode. Read and weep. It is only 2010. Amazon still are not aware that there are other languages than English. Anyway, if I’m not dropping books, then why to get Kindle? It was clear to me that I need one, but why? Print the document. Not good as it wastes lots of paper and it is not convenient to walk around with a bunch of pages. In addition, next page always gets lost. Read on computer. This means that I have to sit in front of computer and read the document. What do you mean I can’t read lying on a sofa at salon? It is not as easy to read from laptop screen as from e-ink or book. It takes a long time (relatively) to get into a reading mode. The laptop gets hot and heavy. It has to be open to read from it and takes space. I’ve checked and the results were as predicted: I did not read books in PDF and DOC format apart from a very rare exceptions. 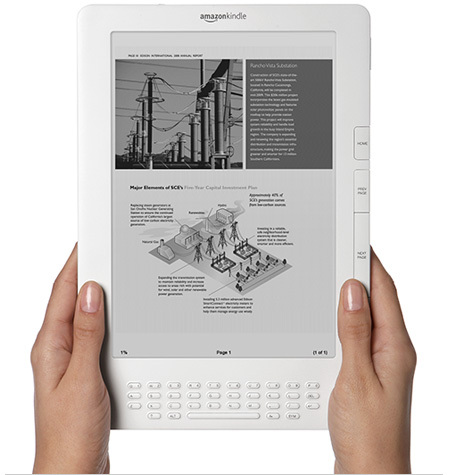 I hope that with Kindle DX it will change. Another reason is very simple one. To get a book from Amazon takes about 6-8 weeks using sane delivery method and costs about 30$. This means that it is a huge waste of time and money to get a single book from Amazon. On the other hand, getting a bunch of books is a considerable amount of money. Taken together, I rarely order books from Amazon and when I do, I do it in batches. Now I have Kindle. I can get a book within minutes, without additional payment and cheaper than the printed edition. I have a feeling that Amazon is about to get much larger part of my income. ЎUf, me gustу! Tan clara y positiva.